Home > Google News > Google Maps > Google Maps Still Allowing Anonymous Reviews? Google Maps Still Allowing Anonymous Reviews? A Google Business Help thread has complaints from business owners that anonymous Google users can still leave reviews for business listings in Google Maps. 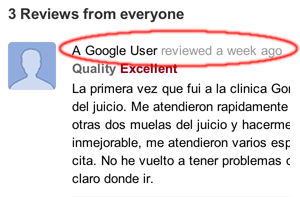 When Google upgraded Google Maps to Google Local + or whatever they call it now, they started requiring users who want to leave reviews for a business to sign into their Google+ accounts before leaving a review. Then the review would show their names. It seemed fair, why let someone leave a review in a public setting about a public business when the person leaving the review is anonymous. But as you can see, reviews from weeks ago still allow anonymous "Google user" to leave reviews. Jade Wang from Google said, "Thanks, all -- we are investigating." But this issue doesn't seem new, I think we covered it a few months ago and it is still an issue.